Since I missed Mask Monday this week, I thought I'd make it up by sharing 2 mask reviews instead of one. I've already posted the Pumpkin wash-off mask review, so here's the second mask review. The pumpkin might have been a let down for me but this bubble sheet mask is so much better. Plus, it's super fun to use! 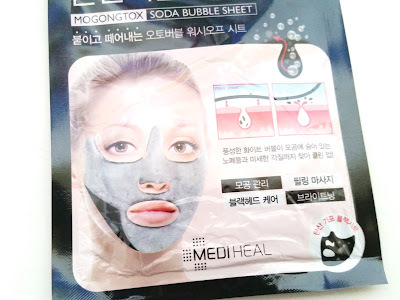 This bubbly mask here is the Mediheal Mogongtox Soda Bubble Sheet. Man, what a name! Every time I read a mask with the word bubble in its name, I think of the bubbly cloud mask and wonder how they will compare. What's unique about this bubbly mask is that it actually comes with a sheet, instead of the stand alone bubbles. I've been wanting to try this mask for a while now, good ol' Memebox read my mind and send it to me for review. So, let's get to it. 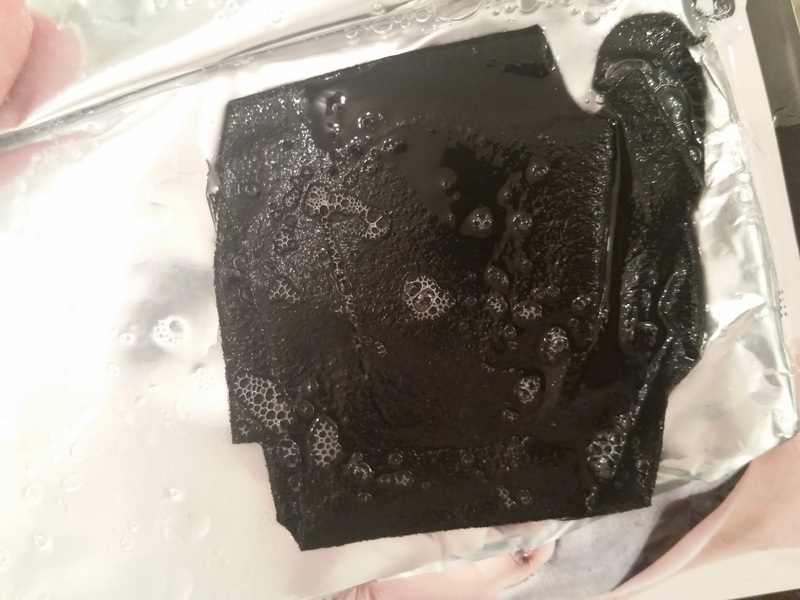 Product Description: A unique bubbly sheet mask that works to provide deep cleansing to the pores. Leaving the skin tighter and brighter. The mask is formulated with various herbal extracts and carbonated water. It will create micro bubbles by itself to help take care of the pores. The bubbling action also works like a mild facial massage to soften up any deep seated dirt so that it can be washed off easily. 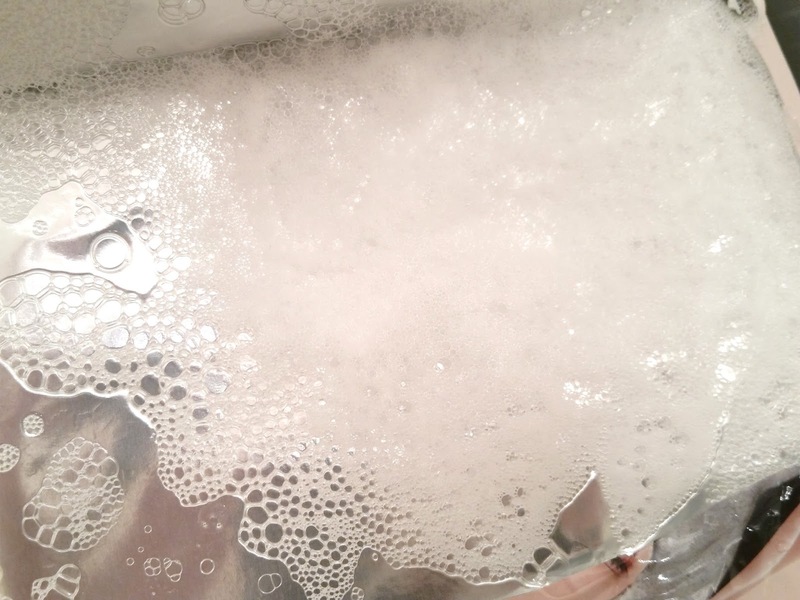 Finally the bubbles can help to remove dead skin cells and make the skin brighter and clearer after use. To use, cleanse and tone the skin first. Make sure the skin is dry and free of excess oil before applying the mask. Now, take the mask and apply it onto the skin. Let the mask bubble for 10 minutes. Remove the mask and wash off. Ingredients: Water, glycerin, cocamidopropyl betaine, sodium cocoyl apple amino acids, dipropylene glucol, disiloxane, sodium lauroyl glutamate, mrthyl perfluorobutyl ether, methyl perfluoroisobutyl ether, hydroxyethylcellulose, phenoxyethanol, chlorphenesin, caprylyl glycol, 1,2-hexanediol, propanediol, fragrance, disodium EDTA, illicium verum (anise) fruit extract, carica papaya fruit extract, phaseolus radiatus seed extract, pyrus malus (apple) fruit extract, castanea sativa (chestnut) bark extract, diospyros kaki leaf extract, oryza sativa (rice) bran extract, carthamus tinctorius (safflower) flower extract, sodium hyaluronate, propolis extract, hamamelis virginiana (witch hazel) bark/leaf/twig extract, carbonated water (0.018mg), galactomyces ferment filtrate, butylene glycol, milk protein extract. 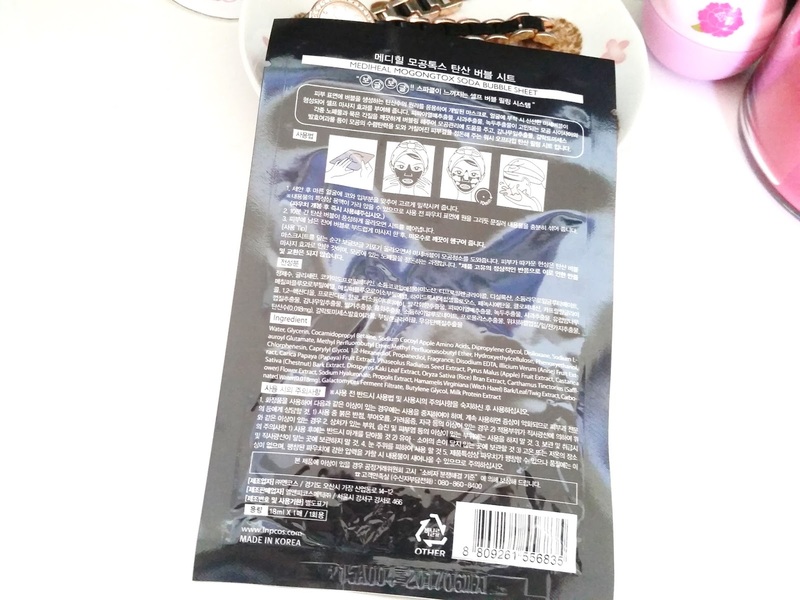 Packaging: The mask packaging is pack full of information on both the front and the back. The majority of the information is in Korean. However, I was happy to find the English ingredient list on the back. Yay, no need to translate! Unfortunately, the directions are in Korean, however, I was able to find the directions on Membox and shared it above. Scent: The mask has a mild floral perfume scent to it. Once the mask is applied onto the face and begins to bubble, the scent kind of disappears. Color: The sheet mask itself is pretty much black in color. 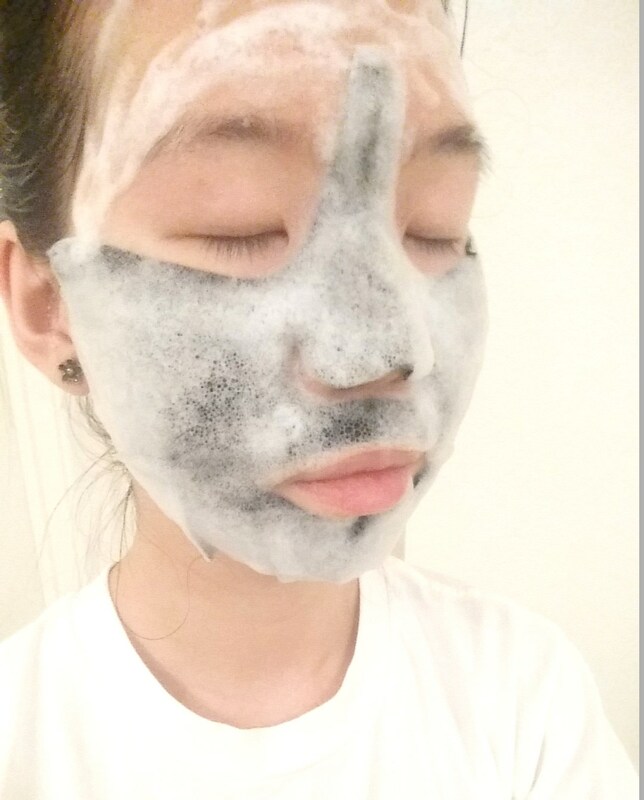 The bubbles are white though and since the sheet mask is black you can see the bubbles vividly once it starts the bubbling action. Texture: The mask sheet itself was interesting in texture. It was a sheet but with a soft velvety/silky feel to it. It was definitely different than normal sheet mask but I can't quite put my finger on it. My Thoughts: It bubbles! Just like the bubbly cloud mask. The sheet it came with made the mask a little different than other bubbly masks. 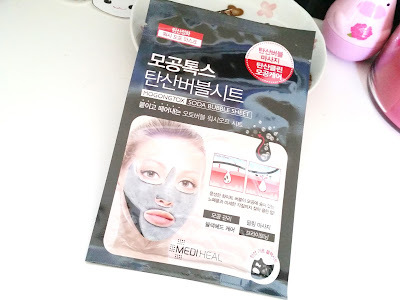 I'm not sure if the sheet is the whole reason for this or if its formula has something to do with it too, but this bubbly mask from Mediheal didn't tickle me at all. I could feel the bubbles fizzes and pop on my face but it wasn't a ticklish feeling like the Piggy Bubble mask. I would have left it on my face for 10 whole minutes if not for the miscalculation I had. Sheet mask inside the packaging. It's already starting to bubble! With masks that comes with a one size fits all sheet, you're bound to have issues with the fit. Unless you are lucky and the mask fits you well. For me and this Mediheal bubble mask, the nose area was the issue. The tip of the nose part was too big and over covered my nose a bit. At first it wasn't so bad but at the 5 minutes mark, when the bubbles become super cloud fluffy herds, it became a slight issue. When I inhaled I could see and feel the bubbles getting sucked into my nose. It got so bad that I had to breath through my mouth. However, after the 7 minutes mark the bubbles were starting to go into my nose on their own. Probably because that's one of the few areas not filled with bubbles. At that point I was trying to hold back laughter, because, well, it was kind of funny. I was also trying to figure out a solution. Realizing that if I don't do something I'll have bubbles in my nose. I ended up removing the mask at about the 9 minutes mark. I was worried the bubble mask might dry my skin, but it didn't. It was able to cleanse my pores and brighten my skin a bit, which was super nice. My skin felt really soft and smooth after I washed off the bubbles. As a plus, the mask did not irritate my sensitive skin. I have to say, I am super pleased with this mask. The mask also came with a lot of essence. As you can see in the mask selfie below, I applied some of the excess essence onto my forehead. The excess essence in the mask pouch bubbled too. Final Thoughts: I really, really like this mask. I had my worries because there are some ingredients on that list that I've never really had contact with. I was afraid my skin would react to it or something. Luckily it didn't. I think the biggest plus side about this mask for me was that it didn't tickle. All the other bubbly masks I've tried so far tickled me like no tomorrow. However, this one didn't. It actually felt nice. I also like that it was able to cleanse my pores and that it didn't dry out my skin. It did brighten my skin a bit as well. The plus side of things is that it was super fun and easy to use. The only small downside of this mask is that the sheet is one size fits all. So it might not fit everyone. Make sure to adjust nicely and don't make the same mistake I did. Or you might have bubbles trying to get into your nose! Would I purchase this in the future! Most definitely! I really like this mask, it's bubbling actions are awesome. I know I'll want to pick up a couple more to stock up on! Do I think this mask is worth a try? Heck yes. If you want a super fun bubbly mask that does a great job at cleansing pores without the tickling feeling, this Mediheal mask is it. Plus it's super inexpensive too! Have you tried this awesome Medheal Mogongtox Soda Bubble sheet mask yet? What are your thoughts on it? Let me know in the comments below! Disclaimer: This product was sent to me for review purposes, however, all opinions are honest and my own. I was not compensated in any other way. 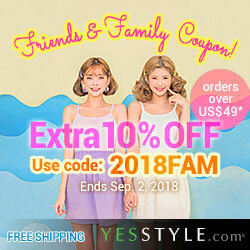 This post contains affiliate/referral link, which helps to support the blog, my full disclaimer here.